More photos to follow soon!!! 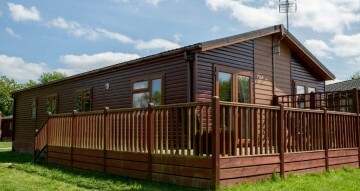 The Wessex Summerhouse is a beautiful 2 bedroomed lodge and is on one of the most beautiful pitches here at Yaxham Waters Holiday Park. Overlooking our largest fishing lake and with its very own landing station ideal for fishing. 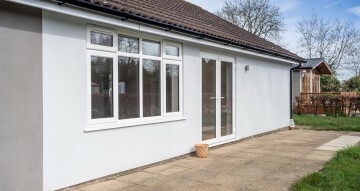 The lodge has its very own purpose built veranda which sweeps round the whole structure and has great views not only of the lake but also of the rolling fields in the distance and the mid Norfolk Steam Railway line which runs adjacent. The position of the lodge means you get the sun all day long and the sun sets directly in to the lounge. The lodge itself is double glazed and centrally heated. The Summerhouse has its very own utility room that leads from the entrance. The lodge has a feel of a country cottage with solid wooden beams and vaulted ceiling free standing dining room table and chairs. 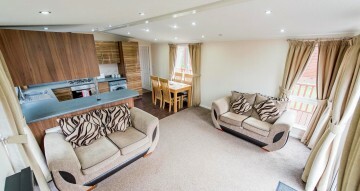 There is a real feel of space and the lodge has 2 sofas and a really well equipped kitchen with all the modern attributes you would expect such as fridge freezer, washer drier, gas hob and oven, microwave, breakfast bar. As you walk through the lodge down the separate hallway you have the family bathroom with bath, sink and toilet and just a little way on from there you have your 2 bedrooms. The first being your double bedroom with ensuite bath, toilet and sink there is loads of storage space and towards the back of the lodge there is another shower and toilet! !